Call a REAL RESORTS WEDDING SPECIALIST Today! Just imagine saying "I DO" amidst the breath-taking turquoise views of the Caribbean Sea, white beaches, lush tropical gardens, seaside gazebos, and beautiful romantic sunsets. 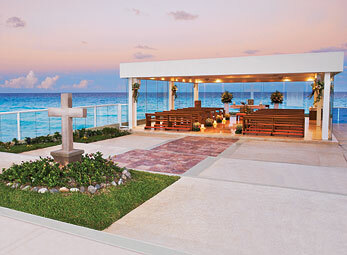 Catholic ceremony is also available nside the one-of-a-kind, Oceanfront Catholic Chapel Our Lady of Guadalupe...the perfect start to a perfect wedding! Real Resorts professional Wedding Planners will take care of each and every detail, from helping you select the ideal bridal bouquet, wedding location, and décor options; including an array of ultimate catering touches that will exceed your expectations. 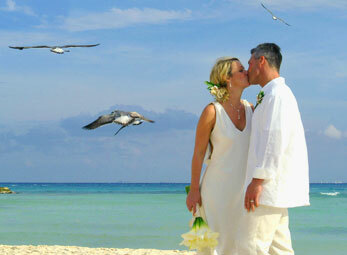 Destination weddings are far less work than traditional weddings. 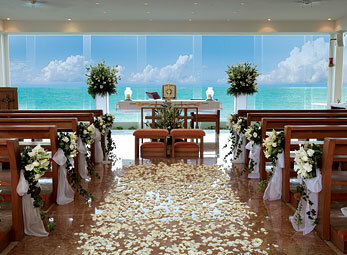 The Royal in Cancun also offers a FREE WEDDING PACKAGE. 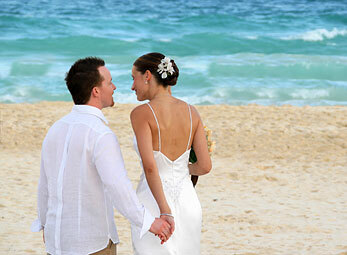 Let our Destination Wedding coordinators help plan your beach wedding today at the fabulous The Royal In Cancun Adult Only Resort. When the wedding couple stays five nights or longer in a Master or Presidential suite or 20 ocean view guest suites with a minimum of 5 nights at a participating Real Resort*, the wedding package is complimentary. 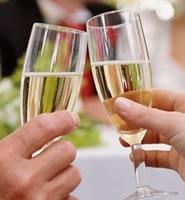 * For weekend evening weddings from 4:00 p.m. there is a surcharge of $400 USD (Thursday-Sunday). - Additional guests sepplements same for 2011/2012. Simple elegance for a spectacular once in a lifetime event, let us assist you in creating the wedding of your dreams.. Your choice of Minister, Justice of the Peace or Catholic Priest: $400 USD will be added to your package price. Aforementioned wedding officials are bilingual. Your choice of Minister, Justice of the Peace or Catholic Priest: $400 USD will be added to your package price Aforementioned wedding officials are bilingual. Cancun only, with the best view of the Caribbean. The Mayan Ceremony is spiritual, interactive and in harmony with nature, the universe and the four basic elements (Fire, Earth, Water and Air). 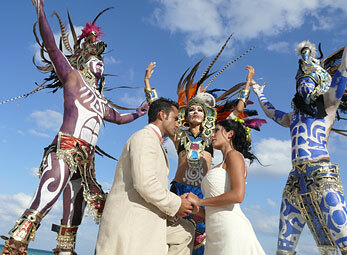 The Shaman will bless the union, setting an altar for the Mayan gods with flowers, fruit, seeds and fire. This ceremony takes place on the beach.. The Luxury Wedding package includes the following. Rose petal turndown service and romantic scented bath for two in your in-suite double Jacuzzi (subject to suite category and resort). The Ultimate Luxury Wedding package includes the following. Additional capacity or extra yacht (up to 15 guests each) $400 USD per hour (minimum 3 hours). Leaving from Playa del Carmen: $400 surcharge. * Bigger boats are available upon request. Private Air (Round-trip or One-way options). Note: Airplanes are based in Cancun. Available only for U.S., Canada, Mexico and Central America. Plane overnights add 1 hour.